I would like to take this opportunity to wish each and every one of you a safe and joyous Christmas season. My good wishes encompasses an especially wonderful year for 2006 - may your life be wonderful and full of lace adventures. Here is myfirst effort at making a leaf spider (that is what I ended up calling this type of spider). 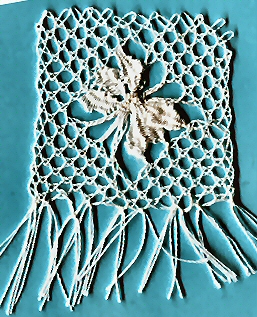 This is my second attempt at making leaves (my first attempt is here in dolphin) so the execution is not the best, but it does prove to me that the pricking I designed on Lace 2000 works. In this sample the 'legs' are actually plaits and the centre is cloth stitch (I wove as I went) but I think it could be varied - have a go and let me know how your interpretation looks. - you can open and print out or download and keep - it's up to you.